Mentioned is the way you can write Shop Avionics Technician CV Template. 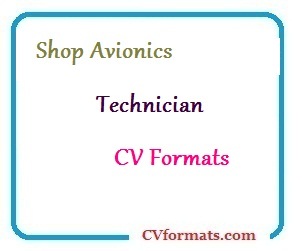 People looking for jobs can easily download these Shop Avionics Technician CV formats in editable pdf and MS-Word (.doc) formats or you can just copy and paste from or website CV Formats.com and app. Cover letter of Shop Avionics Technician CV Template is also available. Just change the name , address , qualification and experience and your Shop Avionics Technician CV Template is ready. Perform test routine, repair and overhaul at the shop level on avionics navigational equipment on the B747, 200 and 400 passenger aircrafts. Perform tests and minor repair on Airbus A300, A320 and A340-800 aircrafts. Participate in quality and productivity improvement programs on the shop floor. Test and repair avionics instrumentation on the B737 400 series. Above average computer literacy in using automated aircraft maintenance parts inventory and job productivity systems. Excellent communication and interpersonal skills in English to work in a team.